Cheap Car Insurance Toronto, Compare Lowest Quotes & Save! Getting Cheap Toronto Car Insurance Quotes Is Easy! For over 45 years, ThinkInsure has been helping drivers save by comparing cheap Toronto car insurance quotes from the leading insurance companies. Our insurance professionals provide expert savings advice and can get the lowest rates to help our customers save on their car insurance. Savings : We save you money. We can get you quotes from the top insurance companies. Our customers get the cheapest rates and save hundreds each year on their car insurance. Selection : We give you lots of choice. We get you the best car insurance coverage and the lowest rates in Toronto. Compare quotes and choose the best option for your car insurance needs. Service : We value your business. Customer service and satisfaction is a top priority for us. Our team of experts goes the extra-mile to address our customers auto insurance needs. Made Easy : It's quick, simple and free. We make the process of getting car insurance easy for Toronto drivers. We provide expert savings advice, get the best Toronto quotes and then make it easy for you to get your coverage. Want cheap insurance quotes in Toronto? Take a couple of minutes of your time to compare Toronto car insurance quotes with us! Compare Toronto car insurance quotes online now and start saving. You can also call toll-free 1-855-550-5515 and we'll be happy to compare the cheapest quotes in Toronto for you. Want cheap car insurance? We all want cheap insurance in Toronto. Whether you drive a car, truck, SUV or any other type of vehicle, saving on Toronto car insurance is important. With Toronto car insurance rates some of the highest in Canada, finding ways to reduce prices and find low cost solutions is a must. Rates are on the rise. Each time your policy is up for renewal is an opportunity to get more affordable rates and save money. 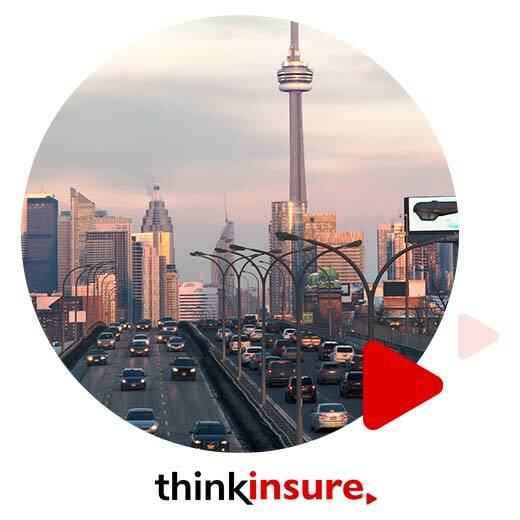 At ThinkInsure we can help you get the cheap auto insurance in Toronto you are looking for, while ensuring you get the coverage you need to be protected when driving throughput the GTA. Getting the lowest car insurance quotes is possible when you choose ThinkInsure. We’ll help you get low cost car insurance in Toronto. Cheaper rates and great coverage is what we do best! Toronto is the largest city in Canada. It has close to 6 million residents across the Greater Toronto Area. It also has the most drivers, traffic, and is known for long commutes and highway driving. With so many vehicles on the roads daily and the increased risk of accidents, it’s imperative you have a good policy for Toronto car insurance. You never know what could happen when commuting on the 401, 427, Gardiner Expressway or DVP. Busy parking lots, vehicle theft and insurance fraud are all additional concerns Toronto drivers have. They are also contributing factors to why car insurance rates in Toronto are so high. Want to get the cheapest car insurance rates in Toronto? It’s easier than you think. Simply work with a ThinkInsure insurance expert to compare auto insurance quotes in Toronto and save on your insurance. Getting cheap car insurance in Toronto and across the GTA is even more important than in other cities in Canada for one simple reason – auto insurance rates in Toronto tend to be higher, on average, than any other city in the country. In fact, Ontario in general is the most expensive province to insure a vehicle. Failing to get a Toronto car insurance quote could cause you to miss out on cost savings. Many of our customers save up to $500 or more on insurance. Is It Possible To Get Cheap Insurance In Toronto? Amid the high insurance costs and rate increases, it is still possible for drivers to get cheap insurance in Toronto. You just need to be diligent and work with a broker to compare quotes. When you choose ThinkInsure, you open the door to more Toronto car insurance coverage options and more savings opportunities. We’ll help you reduce your rates and get cheap affordable car insurance quotes. Why Are Auto Insurance Rates Higher In Toronto? There are more cars on the road. There is more traffic when compared to the majority of other cities. Accidents are more frequent and likely to occur. There is a greater risk of car theft, vehicle break-ins, and instances of insurance fraud. All of these factors add up to an increased level of risk for insurance companies, meaning higher car insurance rates for drivers in Toronto and across the GTA. We understand this is not an ideal situation. The good news is there is something you can do about it to get the cheapest car insurance rates in Toronto – shop around and get Toronto car insurance quotes. To get started, all you need to do is enter some basic information into our online car insurance quote tool and we will quickly compare multiple quotes for you. Then you can make your choice from the cheapest rates in Ontario. You can also call toll free 1-855-550-5515 and one of our licensed experts will be happy to help you. Shop around : There are lots of insurance companies in Toronto. Our insurance experts can help you get quotes from multiple insurers to compare your options. Bundle coverage : Have a car? Rent or own a home or condo in Toronto? Bundle coverage into a single policy. Review your policy : Review your policy when getting your annual Toronto auto insurance quote. Discounts : Always ask about available discounts for additional cost savings. Winter tires : Install winter tires to immediately quality for a car insurance discount. Driving school : Completing driver training will help you get a good start to your record as an insured driver. Increase your deductible : If you can afford to do so, increase your deductive to lower your insurance rates. Want To Save On Car Insurance In Toronto? It makes sense to shop around before making a major purchase decision. You shop around when buying a home, a vehicle, a television, and even when shopping for groceries. And car insurance is no exception. If you are a driver in Toronto, you need to explore your car insurance options before renewing your insurance policy. Did you know that insurance rates charged by car insurance companies in Toronto to insure the same vehicle and driver can vary significantly? In some cases, rates can vary by hundreds and even thousands of dollars. Therefore, it pays to explore your options each time your Toronto car insurance policy is up for renewal. However, too many Toronto drivers are leaving money on the table and simply renewing their policy without reviewing it. We understand that with so many car insurance options, it can be overwhelming. Calling up insurance companies to get quotes and discuss rates is time consuming and difficult for people to do. We get that you have a busy life, and this is why we make the process of comparing competitive, cheap car insurance rates quick and easy. Simply enter your basic information online and we will compare multiple Toronto car insurance quotes for you. Then just make your choice from the cheapest rates. You can also call 1-855-550-5515 and one of our experts will be happy to help you. Don't be left wondering if the car insurance quote you're getting is the best rate. If you reside in Toronto and you're looking for the best car insurance coverage at a cheap rate, we will find what you're looking for. How Much Is Car Insurance In Toronto? This is a question that all drivers want to know the answer to – and in most cases the answer will be “too much”. It’s no secret that Toronto has some of the highest car insurance rates in all of Ontario. Unfortunately, since you live in the Greater Toronto Area, you can already to expect to pay more than other Ontario drivers simply because of where you live. However, by putting time and effort into controlling other factors that impact your insurance rates, you can get the cheapest car insurance in Toronto for your situation. Our experts can help you get the best car insurance rates and coverage. What Is The Average Car Insurance In Toronto? People want to know the average cost of insurance because they want to see where their Toronto car insurance rates fall within the spectrum. Are you paying more or less than the average cost of car insurance in Toronto? And by how much? So, what does average car insurance in Toronto look like? How much is the average cost of auto insurance in Toronto? As you would expect, it is higher than the Ontario provincial average, but it’s not the highest in the province. The average annual cost of car insurance in Toronto is $2,071. This works out to about $172.58 per month. How Much Is Car Insurance Per Month In Toronto? Based on the annual average cost of Toronto car insurance, drivers can expect to pay $172.58 per month in Toronto for car insurance. Rates will vary based on your specific insurance policy needs, driving history and other factors. Get a quote to confirm an accurate quote. How Do I Get The Best Car Insurance In Toronto? We know that you want to get the best car insurance rates and coverage. Getting the best auto insurance is somewhat subjective. It all depends on your current situation, driving and insurance needs. For some people, the best car insurance is based on getting the cheapest car insurance rates. For others, it’s about getting specific coverage or having access to a Toronto insurance broker that provide great customer service. Think about what is most important to you. This will help you determine what is the best car insurance in Toronto. We can help you find a policy that meets your criteria for price and coverage. One of the ways you can find out the cost of auto insurance in Toronto is to use a car insurance calculator. Online car insurance calculators make it easy for you to fill out your information so you can assess your coverage and cost options. You'll get a sense of the average Toronto car insurance rates you can expect to pay, based on the information you provided. They are definitely a great resource when shopping for car insurance. Check out the ThinkInsure Toronto Car Insurance Calculator. We get a lot of questions about how to get cheap car insurance for first time drivers. Getting cheap car insurance for new young drivers in Toronto can be somewhat of a challenge. As a new driver you don't have much driving experience or history. So you will likely pay higher auto insurance rates compared to more experienced Toronto drivers. Also by living in Toronto, you reside in an area that has some of the highest insurance rates in Ontario and all of Canada. So if you want to get the cheapest Toronto car insurance make sure you do your homework, compare quotes, attend driving school, and work with an insurance expert. If you want to get the cheapest car insurance in Toronto and across the GTA, even if you are a new driver, call us toll-free 1-855-550-5515 and they will help find you the best quotes and coverage for your needs. Toronto insurance professionals know the insurance market, and they know what it’s like to be a vehicle owner in one of the busiest cities in the world. There is a lot to think about not only in terms of your vehicle and driving, but also for how to insure it. Whether you commute every day, or only use your car occasionally in the evening and on weekends, Toronto auto insurance experts know how to help you shop for insurance and choose a policy that matches your driving habits. At ThinkInsure, we make it quick and easy to get cheap location car insurance in Toronto. Whether you are renewing your policy, need to make changes to your coverage, or even if you are getting insurance for the first time, we’ll help you shop around and save. Simply provide us with your information and we’ll compare quotes and coverage for you online or over the phone. Taking a few minutes to compare quotes will help you get the lowest rates. Toronto is Canada’s largest city, the 4th largest in North America, and it also serves as the capital of Ontario. It is home to some of the busiest highways, traffic congestion, and challenging driving conditions. This makes it extremely important to have dependable car insurance coverage. With thousands of vehicles, cyclists, pedestrians, and no shortage of other things you have to navigate during your daily commute, sometimes being a good and save driver isn’t enough. You never know when you could find yourself in a fender bender, but when you have dependable car insurance from Toronto’s best car insurance provider, you can take a deep breath and rest assured that you are covered and have peace of mind in knowing you have the best car insurance coverage. For those with a great driving record and even those with the not-so-great driving record, we can give you the best rates available in Ontario. We can get affordable coverage young drivers or new drivers. If you are considered a high risk driver we specialize in high risk auto insurance. Do you have a long commute each day? Do you only drive occasionally? Do you drive an older vehicle? Are you a student or first time driver? Do you have multiple drivers on your insurance coverage? Do you need coverage for multiple vehicles? No matter where you live in the city, ThinkInsure can help you get car insurance coverage that makes sense for your situation. 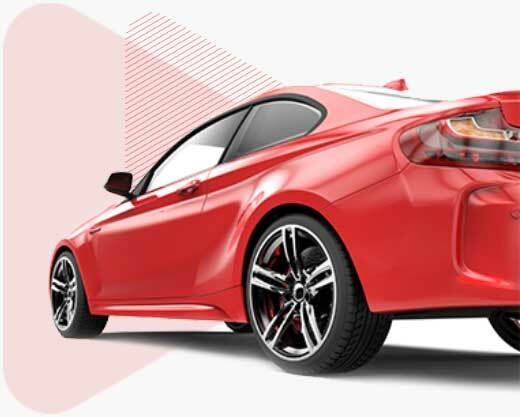 Compare Toronto car insurance quotes online or call toll-free 1-855-550-5515 and start saving! One of the main advantages of working with us for car insurance is choice. With ThinkInsure, you can compare car insurance quotes from 20+ car insurance companies in Toronto. With our large selection of insurance companies you can be sure to get the best rates and coverage for your needs. The insurance companies we work with have many different car insurance discounts and our experts will quickly find the best ones that you qualify for to help you save. There are also savings discounts of up 30% when you bundle different types of coverage such as home and auto insurance. So it pays to bundle your coverage with the same insurance company. 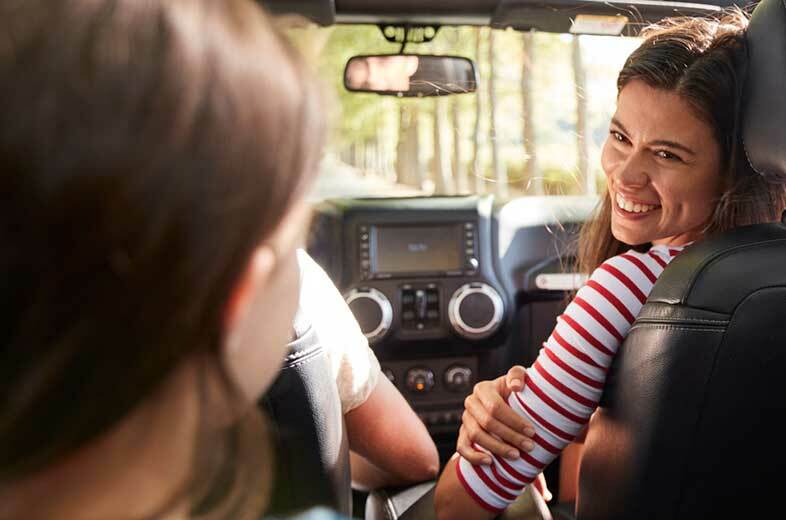 Aviva Insurance Toronto : Aviva provides an extensive list of car insurance options, including accident forgiveness, temporary vehicle replacement coverage, a disappearing deductible and much more. 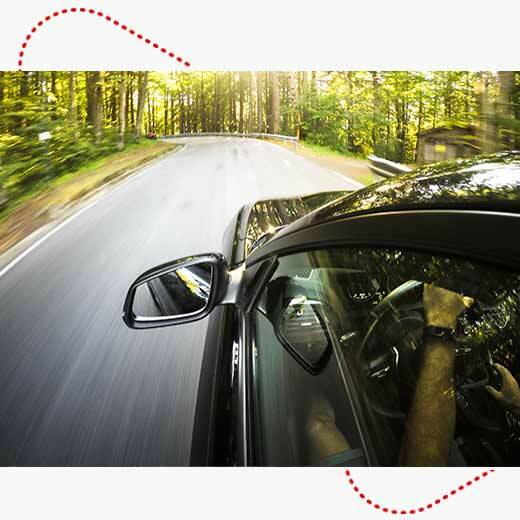 Intact Insurance Toronto : Intact offers auto insurance coverage for all types of vehicles, including cars, RVs, motorcycles and more. 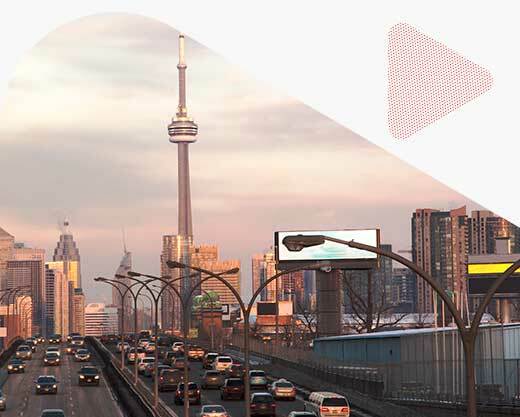 Wawanesa Insurance Toronto : One of the biggest car insurance companies in Canada, you can expect great coverage options, flexible payment options and simple claims processing. 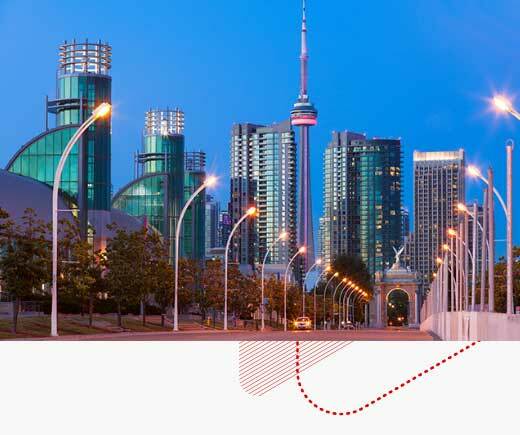 Travelers Insurance Toronto : Get coverage for all types of vehicles and take advantage of a variety of car insurance discounts with Travelers. See our full list of insurance companies that we can get you coverage with to serve you best. Stay Alert When Driving : Remain alert at all times and watch out for pedestrians, cyclists, taxies, and other vehicles. Cyclists : Watch out for cyclists when driving in the downtown core. Avoid Rush Hour : If possible, avoid the downtown core and major highways during peak driving times. Extra Time When Weather Is Bad : Give yourself plenty of time – expect it will take you longer to drive when traffic is heavy and when driving conditions are poor. Construction : Expect construction delays when driving in Toronto. Check the traffic before you leave to see where the construction delays are. Know You Route : Know where you are going – using a GPS to provide you with directions. One Way Streets : There are many one way streets in the city – always be conscious of them. Pass Street Cars With Caution : When streetcars come to a stop and the doors are open, do not pass – pedestrians get on and off at all stops. Parking Is Expensive : Expect to pay premium prices for parking in the downtown core – consider parking at a commuter lot and taking the subway or go train into town. Gas Up Before You Go Downtown : Fill up on gas before you head downtown – gas stations there are more expensive and are less common. Wildlife : Watch out for wildlife when driving on the highway – especially during the spring and fall. Parking At Night : Always park in well-lit parking lots in high traffic areas. These tips are a great refresher for Toronto drivers and provide new drivers to the city with some things to think about when driving in the Greater Toronto Area. More traffic tickets and violations. 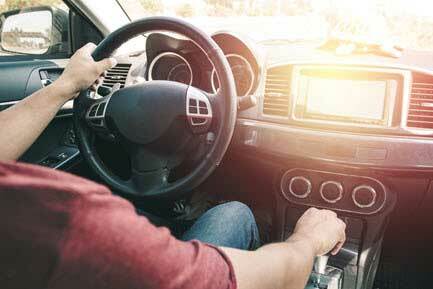 An increase in the risk of auto theft. Increased instances of auto insurance fraud. Each one of these factors contribute to insurance companies providing different car insurance quotes depending on the specific algorithms they use to determine auto insurance rates – meaning some rates are higher and some lower than others. Make sure you get the best car insurance rates in Toronto by choosing ThinkInsure for your insurance. We will shop and compare to get you the best coverage and rates. We'll make the entire process of buying car insurance easy. Driving in Toronto is unlike anywhere else in Ontario. All of the province’s major highways pass through the region. Population Of 5.8M : The Greater Toronto Area - or GTA - is home to some 5.8 million people in the central city of Toronto and in the four municipalities of Durham, York, Peel and Halton that surround it. Just Toronto itself has 9,250 different streets, 31,160 street intersections and 2,231 traffic control signals over 5,617 km of road. 2.5M Daily Commuters Drive : As the largest CMA (Census Metropolitan Area) in Canada, the Greater Toronto Area has a lot of cars. While Canadian car and truck ownership averages 86 percent, not all of Toronto's 2.5 million daily commuters drive. But most do. Most Drivers Don't Have Passengers : Two out of three trips into and out of Toronto is by single occupant vehicle. Busiest Highway In North America : The segment of Highway 401 that passes through Toronto is the busiest highway in North America and one of the widest and busiest in the world, with AADT (Average Annual Daily Traffic) exceeding 400,000 vehicles in some sections. That's a whole lot of cars and trucks. What the above facts help illustrate is that, quite simply, Toronto is a big, busy city with lots of cars on the road. This translates to lots of driving and lots of traffic congestion, which can lead to accidents - especially multi-vehicle accidents. 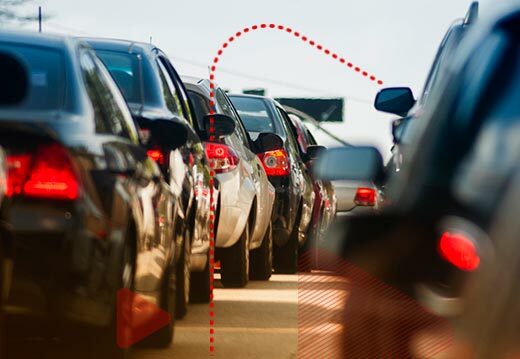 Factor in pedestrians, cyclists, and public transportation (TTC), and there is no shortage of things that drivers need to pay attention to when behind the wheel. How Much Does It Cost To Insure A Car In Toronto? 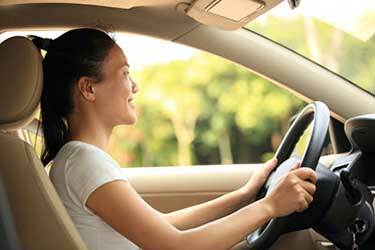 The cost to insure a car varies from driver to driver. The neighborhood you live in, your vehicle, and driving habits all impact your insurance rates. Getting an insurance quote is the best way to determine your insurance costs. How Do I Get Cheap Monthly Car Insurance In Toronto? If you want cheap monthly car insurance premiums, it’s important to compare quotes and coverage options. Compare quotes when your policy is up for renewal, when you make changes to your policy and when your vehicle, or driving status, changes. This will put you in the best position to lower Toronto car insurance costs. A broker always gives you the best opportunity to get cheaper rates. Our team will help you search for cheap car insurance in Toronto and find better rates. We’ll do the comparison shopping for you so you can save. Can I Get Online Quotes For Cheap Car Insurance In Toronto? Yes! You can compare Toronto car insurance quotes online anytime with ThinkInsure. Simply enter your information, tell us about your coverage needs and get access to the cheapest quotes. Where Do I Get Cheap Car Insurance Offers In Toronto? If you want cheaper car insurance in Toronto, you need to choose a brokerage like ThinkInsure. We can provide you with more cheap car insurance offers because we’ve partnered with all the top insurance companies in the GTA. What Is The Best Way To Compare Toronto Car Insurance Quotes? Working with an experienced insurance professional is your best option to compare car insurance quotes. They have access to coverage and quotes from multiple insurance providers. Why Is Toronto Auto Insurance The Most Expensive? Auto insurance is the more expensive in Toronto because there is greater risk. There are more accidents, auto theft rates are higher, and there are more claims compared to other cities. What Are The Main Factors Impacting Toronto Auto Insurance Rates? Two of the biggest factors impacting the high cost of auto insurance in Toronto are insurance fraud and the increasing cost of insurance claims. These factors impact rates in addition to factors you can control – the car your drive, how much you drive, among others. How Much Can I Save On Car Insurance In Toronto By Using A Broker? With ThinkInsure, you could save up to $500 or more on car insurance by getting a quote with us. We’ll help you compare your options and find you the cheapest insurance rates based on the information you provide to us. What Are Some Tips To Lower Your Toronto Car Insurance Premiums? There are many ways you can reduce your car insurance premiums. Perhaps the most important thing you can do is get a car insurance quote each time your policy is up for renewal. Each year is an opportunity for you to save money. Why Does Location Affect Toronto Car Insurance Cost? Auto insurance rates are based on risk factors. More risk in a particular area the higher the cost of car insurance. Toronto is considered to be a high risk area because of the traffic volume, number of cars, and accident rates. Which Insurer Offers The Cheapest Car Insurance Toronto? There is no one insurance company that offers the cheapest rates. With so many factors to consider, if you want to get the cheapest car insurance in Toronto for your situation, you need to shop around and compare rates with multiple insurers. Can I Get One Way Car Insurance In Toronto? One way insurance may be available through certain car insurance companies in Toronto. Speak with our insurance experts to explore your options. Can I Get Temporary Car Insurance Toronto? Yes, it is possible to get temporary car insurance in Toronto. However, not all insurance companies offer this type of short term car insurance. How Do I Know If I’m Getting The Cheapest Car Insurance In Toronto? The most effective way to know if you are getting the cheapest car insurance in Toronto is to compare quotes with an insurance broker. 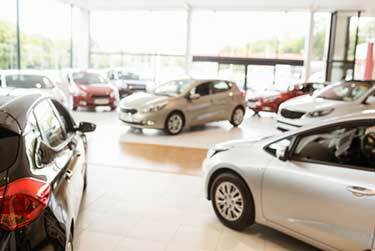 Shopping around is the best way to save on auto insurance. When Should I Shop To Find Best Cheap Car Insurance In Toronto? There is never a bad time to shop around and compare quotes. We can help you find the best cheap car insurance in Toronto when your policy is up for renewal, if you are considering switching providers, or when you want to make chances to your coverage. We’ll help you shop and save anytime. We are licensed Alberta and Ontario car insurance professionals. So if you are an Alberta or Ontario driver we can get you coverage. Since we work with so many insurance companies you'll be able to compare multiple quotes for your region and get the lowest rate. Like all other drivers, we’re sure you want to get cheap car insurance in Toronto. We can help you get the best prices and lowest Toronto car insurance rates. All you need to do is take a few minutes to compare car insurance quotes with us. Compare car insurance quotes online or call toll-free 1-855-550-5515 and start saving on your Toronto car insurance! "After my first (ever) accident, I called Lee and she reassured me by detailing every step of the claim process. She went beyond my expectations!" "Dealing with Thinkinsure was a lot less painful than I was used to going through when getting my car insurance. I think I actually enjoyed the experience for the first time!" "After being with the same insurance company for years, it was a smart financial decision for us to change our car insurance plans to Thinkinsure. Saving money these days is more of a priority than ever before for us." "Great service, great people! I wouldn't change a thing. We get great respect and service every time we call. They always double check for additional savings and are very helpful and patient." "I am so glad I transferred to Thinkinsure. I saved over $400 from my previous insurance. The customer service is fantastic; very helpful and courteous and a person I can call on again when in need. The response time is very quick. It's all about customer service and Thinkinsure delivers!" "Been with Thinkinsure for over 10 years now and haven't had a problem with them the entire time. And I like my assigned account manager. He's always there." "I just went to the website to see if how much I could save with Thinkinsure. In less than 5 minutes I found out I could save over $300. I switched the next day." "I didn't really care about my car insurance broker but my friend told me about Thinkinsure. They have saved me hundreds and are always there if I need anything. "